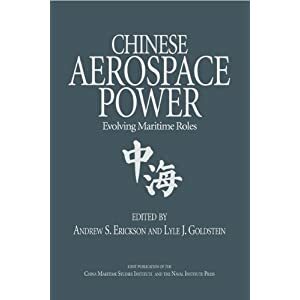 Combining a close knowledge of Asia and an ability to tap Chinese-language sources with naval combat experience and expertise in sea-power theory, the authors assess how the rise of Chinese sea power will affect U.S. maritime strategy in Asia. They argue that China is laying the groundwork for a sustained challenge to American primacy in maritime Asia, and to defend this hypothesis they look back to Alfred Thayer Mahan’s sea-power theories, now popular with the Chinese. The book considers how strategic thought about the sea shapes Beijing’s deliberations and compares China’s geostrategic predicament to that of the Kaiser’s Germany a century ago. 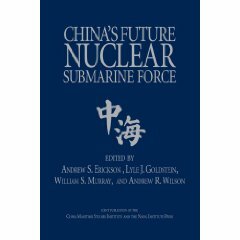 It examines the Chinese navy’s operational concepts, tactics, and capabilities and appraises China’s ballistic-missile submarine fleet. The authors conclude that unless Washington adapts, China will present a challenge to America’s strategic position. …Why China is going to sea has been well documented. What capabilities China needs to fulfill its maritime ambitions is also a well-trodden research area. Indeed, our colleagues at the Naval War College’s China Maritime Studies Institute (CMSI) publish excellent studies of the Chinese navy as a matter of routine. … We employ a research methodology pioneered at CMSI, of which we are affiliate members. The chapters in this volume reference a variety of Chinese open-source literature. The sources come from the impressive collection accumulated by the CMSI library in recent years…. … Given the explosion of publishing outlets and sources in China, it is often impossible to verify the expertise and the institutional affiliation of Chinese authors. As a result, China specialists are increasingly preoccupied with quality control and managing bibliographical integrity. As such, the sources used in this study reflect a careful vetting process based on five benchmarks. First, we make a good-faith effort to identify the authors’ expertise, and we rank the periodicals based on institutional credibility. For example, we give priority to publications from the Academy of Military Sciences, the Chinese Academy of Social Science, and other university-based journals. Second, articles that produce sloppy analysis or far-fetched conclusions are excluded from the analysis. If a source contains technical analysis beyond our expertise, we consult active-duty or retired naval officers with engineering backgrounds or with ample operational experience. Fortunately, such individuals are in abundant supply at the Naval War College. Third, we use studies that seem to parrot Western, especially American, writings, so long as they are helpful in tracking the degree of original intellectual thought in China. Chinese translations of American writings are used sparingly, and only to highlight interest in a particular topic. Fourth, frequent, sustained discussions and debates on specific subjects are attractive candidates for citation and constitute the vast majority of the sources used in this study. Ongoing discourses lay down markers that let us track whether similar debates are taking place in officialdom or are being picked up by policymakers. Finally, signs of divergent thought or, more importantly, consensus on a concept or policy prescription are among the most highly prized sources in this volume. Sustained consensus suggests that an intellectual critical mass has been reached on a particular topic–which allows for strong findings and predictions. 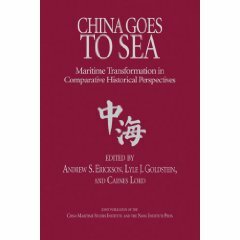 The intent of this extensive literature survey is to gauge intellectual development and sophistication within China’s naval community. We make no particular claims about the authoritativeness of the articles or the degree to which these writings influence policy decisions in Beijing. However, this bottom-up assessment of contemporary Chinese strategic thought provides a basis for capturing potential interactions and exchanges between China’s chattering classes and officialdom. After all, “popular” or professional military journals in the United States, such as the U.S. Naval Institute Proceedings, have produced articles with deep, lasting impact on the U.S. Navy and on the Pentagon at large. We must not discount the influence that forums unaffiliated with government institutions may exert on Chinese strategic thought. It is our judgment, furthermore, that official sources often suffer from rigid ideological correctness and unimaginative analysis, but outlets in the unofficial domain exhibit superior intellectual vitality and creativity. Indeed, we have been continually impressed with the learning, candor, and independence displayed by Chinese thinkers. Those who lump “the Chinese” together as an undifferentiated mass do themselves a disservice. The helter-skelter exchange convulsing the Chinese state and society will amplify the battle of ideas in the coming years, making it harder for the government to crowd external voices out of strategy making. Nor may it see the need. Indeed, Beijing may be looking to outside sources for inspiration. Thus, we maintain that measuring the influence of external intellectual stimuli on Chinese policymakers and planners substantially benefits our understanding of how China’s defense community conducts debates over strategy and operations. Such an evaluation is simply not possible without a thorough knowledge and mastery of China’s burgeoning open-source literature.